The Friends of Mike Freer: A criticism of Mike ! It may surprise you to know that the Friends of Freer are not completely uncritical of Mike ! One thing we've often asked him and he's yet to give us a satisfactory answer to, is why he's so nice to the 5 or so malcontents in Barnet who feel the need to post multiple comments on every single thing he does, no matter how good bad or indifferent. Mike meets lots of people every week who he gets on really well with, but it seems there are some people with nothing better to do than wait for Mike to say something and then make nasty comments. Now the question The Friends of Freer ask ourselves is this. If these armchair critics are so clever, why haven't they got proper jobs? Any suggestions? Both of us are in our 70s. Is it OGL's view that people should have 'proper jobs' in their 70s? 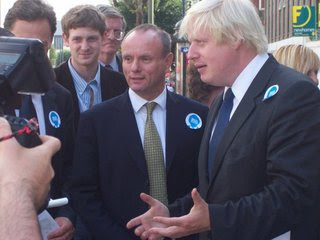 Why are you picturing Mike and Boris, when Boris (no doubt egged on furiously by Socialist Leo Boland) is now going to push 1000s of units of social housing on Barnet due to OGL plan to build thousands of flats? We have been told Boris and Mike are no longer talking. Is this true? Boris & Mike not talking? How will Boris get to sleep at night now? and says that as they aren't "genuine residents" they aren't entitled to take part in public debate. Here's your chance to say something to Mike ! Statler and I are choking on our biscuits at 'Do Call Me Dave', aka Signed myself out of the Priory early by others, comments. Our dear, dear boy. We have a very clear photo of ourselves. Maybe we can suggest you do the same? Maybe just link to you page on the Barnet Council website for ease? Your identity will soon be known when your IP address is traced back to your Council computer! I am a real person, I am self-employed and manage to educate my children privately. You would think I would be a natural Tory voter, but I am not. Barnet waste our council tax money, hide it in bankrupt Icelandic banks, don't give us parents real choice for schools and run a blog whose sole purpose is to provide positive propaganda for Cllr Freer's Parliamentary campaign in Finchley. By the way "Amanda" I have the guts to use my real name and you can see my real picture on my profile. It's a pity the "Friends of Freer" don't.